1. A son of Heman the singer, and chief of the sixteenth of the twenty-four musical divisions into which the Levites were divided by King David (I Chron. xxv. 4, 23). 2. One of the captains of King Uzziah's army (II Chron. xxvi. 11). 3. Father of Zedekiah, one of the princes who sat in the house of King Jehoiakim (Jer. xxxvi. 12). 4. Son of Azur of Gibeon; a false prophet in the reign of Zedekiah (ib. xxviii. 1). He prophesied in the fourth year of Zedekiah's reign that two yearslater Jeconiah and all the captives of Judah, together with the vessels of the Lord's house which had been transported to Babylon by Nebuchadnezzar, would be brought back to Jerusalem. Hananiah thereupon took the yoke from Jeremiah's neck and broke it as a token that the yoke which had been imposed by Nebuchadnezzar on Israel would also soon be broken (ib. xxviii. 2-10). Jeremiah, however, was commanded by God to tell Hananiah to replace the wooden yoke by an iron one, as the yoke to be borne by the Israelites would be still stronger than the former one had been (ib. xxviii. 13-14). Jeremiah denounced Hananiah as a false prophet, and assured him that he would die that same year for having taught rebellion against the Lord. Hananiah died three months later (ib. xxviii. 17). According to R. Joshua b. Levi (Yer. Sanh. xi. 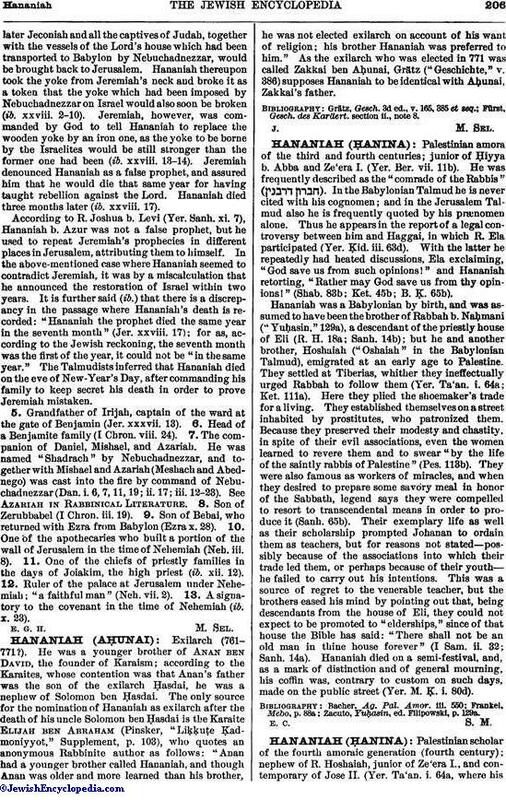 7), Hananiah b. Azur was not a false prophet, but he used to repeat Jeremiah's prophecies in different places in Jerusalem, attributing them to himself. In the above-mentioned case where Hananiah seemed to contradict Jeremiah, it was by a miscalculation that he announced the restoration of Israel within two years. It is further said (ib.) that there is a discrepancy in the passage where Hananiah's death is recorded: "Hananiah the prophet died the same year in the seventh month" (Jer. xxviii. 17); for as, according to the Jewish reckoning, the seventh month was the first of the year, it could not be "in the same year." 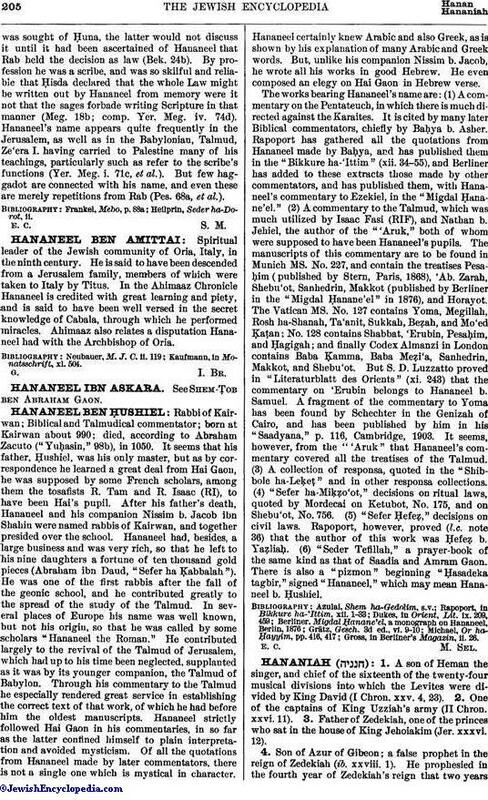 The Talmudists inferred that Hananiah died on the eve of New-Year's Day, after commanding his family to keep secret his death in order to prove Jeremiah mistaken. 5. Grandfather of Irijah, captain of the ward at the gate of Benjamin (Jer. xxxvii. 13). 6. Head of a Benjamite family (I Chron. viii. 24). 7. The companion of Daniel, Mishael, and Azariah. He was named "Shadrach" by Nebuchadnezzar, and together with Mishael and Azariah (Meshach and Abednego) was cast into the fire by command of Nebuchadnezzar (Dan. i. 6, 7, 11, 19; ii. 17; iii. 12-23). See Azariah in Rabbinical Literature. 8. Son of Zerubbabel (I Chron. iii. 19). 9. Son of Bebai, who returned with Ezra from Babylon (Ezra x. 28). 10. One of the apothecaries who built a portion of the wall of Jerusalem in the time of Nehemiah (Neh. iii. 8). 11. One of the chiefs of priestly families in the days of Joiakim, the high priest (ib. xii. 12). 12. Ruler of the palace at Jerusalem under Nehemiah; "a faithful man" (Neh. vii. 2). 13. A signatory to the covenant in the time of Nehemiah (ib. x. 23).